Each year, the Ontario chapters of the Game Artisans of Canada meet up at a secret location and cloister themselves for a weekend of design, playtesting, and comraderie. This year was no exception. If you follow my Twitter feed (@SenFoongLim), you’ll have been spammed with pictures of at least 17 or 18 prototypes from various designers in attendance. From experienced designers like Yves Tourigny (Top This, Blue Prints, Expedition Northwest Passage), to designers who have just had their first signing like Daniel Rocchi (Bomb Squad Academy – a game co-designed with Josh Cappel that’s going to be packed in with TMG’s current Kickstarter, Bomb Squad by Dan Keltner and David Short) and Chris Chung (Lanterns from Foxtrot Games), to journeymen designers like Jessey Wright (who though unpublished, has made good headway through the print and play community with games like Zeppelin Strike), we meet to share our ideas and make each others games just that much better. I can’t go into too many details without express consent from each designer, but I will share some of the pictures here of the games I’m involved in designing. Codename “Voltron” until we find a better name or acquire the IP – from Jessey Wright and myself. Choice Words by Daryl Chow and me is so close to ready, I can feel it in my bones! 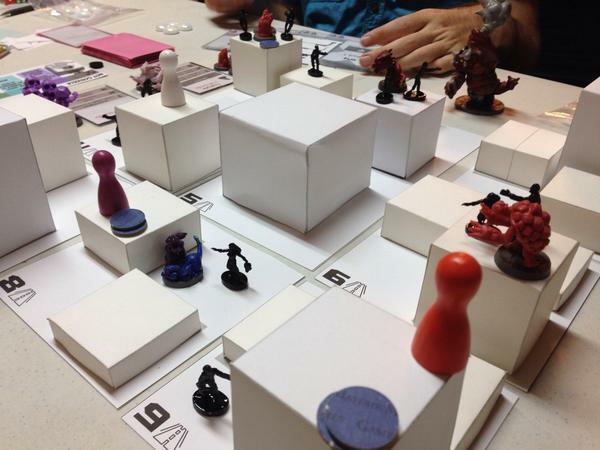 Jessey rolls the dice and tests his might in Crossed Blades, a co-design with yours truly. So, if you’re part of a design group, do yourselves a huge favour and set up a retreat. A day, a whole weekend, a whole week. You’ll thank yourselves for doing it. You’ll be refreshed, have new directions and new ideas, and your colleagues will be more vested in your success as they’ll have a chance to have a hand in shaping your design. Jay and I still love Train of Thought after all these years and we’ve been using Twitter a lot lately, so it just seemed like a natural fit! 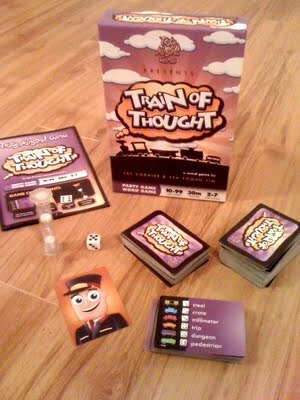 We’re going to do a little experiment and try to run a Train of Thought game (kinda) on Twitter next Tuesday at 3:00 p.m. EST. If things go well, we’ll make it “a thing”. The goal will be slightly modified in that the Conductor (me for the first one), will be trying to get the team (all y’all out there in the Twitterverse) to get to 10 Destinations in 10 minutes. Can we do it? YES WE CAN! Now review the rules, follow me on Twitter @SenFoongLim and hop on board this crazy train! 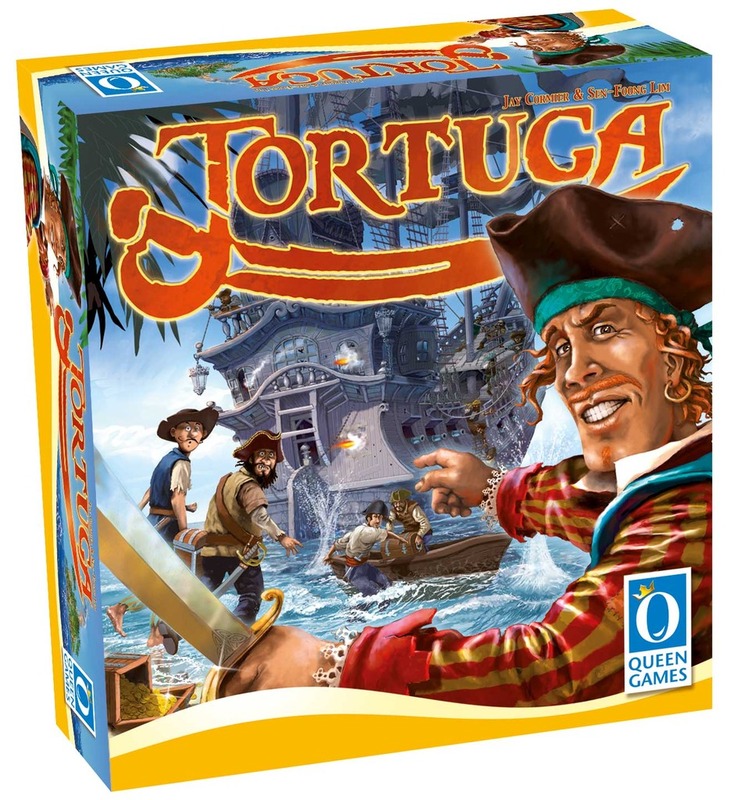 Tom Vasel from Dice Tower reviews Tortuga! While we already got a Dice Tower review from Ryan Metzler about Tortuga, we now have Tom Vasel weighing in as well! Thanks Tom for the review! Just so I’m not super biased I will point out that he didn’t like that there was some set collection with the treasures – that you got more points by collecting a set of red, blue, and yellow. He said it wasn’t very thematic – and I totally agree with him on that one. That is definitely a gamey solution to a challenge we had as designers. The challenge was trying to motivate players to attack one player over another – but have that choice be interesting. When we tried it with either ‘all treasure worth the same’ or ‘different valued treasure’ – it became a non-decision since you’d always go for the highest valued treasure. The way we have it now you have to think about what colour you need – and you can even push your luck by stealing a white treasure (as white can be any colour – but only if you can get it all the way to Tortuga)! So the game works better with the current rule – but yes, it is thematically a bit wonky! He also points out the possibility of King Making on the final turn – which is half-true I think. The game allows players to collect face down treasure tokens and the other players never know if each one has 1,2 or 3 treasure on the other side. So this reduces the ability for a player to know who is going to win and therefore affect the outcome on the final turn. That said – if a player can choose player A or player B to attack on the final turn – it definitely will impact their ability to win…so I do see his point. Regardless – he liked the game and recommends it to families! 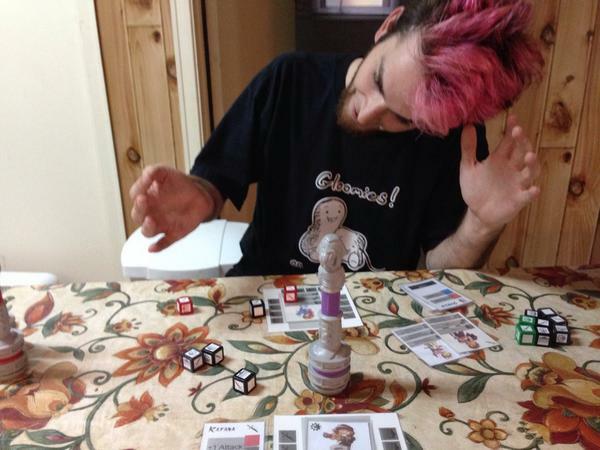 Meeple Syrup Show a Success! The Meeple Syup Show (which Jay and I co-host on regularly) has a brand spankin’ new logo, courtesy of Gavan Brown (he of Roxley Game Laboratory fame) and we’ve knocked out 2 shows with some very cool guests (like Scott Almes, Michael Eskue, Chris Handy, and Micah Fuller). We’ve also got a new website just for the show complete with its own blog at http://www.meeplesyrupshow.com so stick that in your favourites and visit often. That’s where the shows are archived so we’ll point back there every now and then, I’m thinking. We love interacting with the audience, so send us your questions or let us know in advance if you can’t watch live. We’ll get your questions for the guests specifically or about design in general. You can do that on Twitter or on the YouTube channel. Hopefully, y’all follow us @MeepleSyrup on Twitter, so you can get the link when the Google Hangout goes live. If you’re interested on being on the show, write us a note at info@meeplesyrupshow.com and we’ll serve you up a platter of piping hot pancakes, straight of the griddle! Spoiler Alert: He liked it! Good to see Tom playing the game and having fun with it. 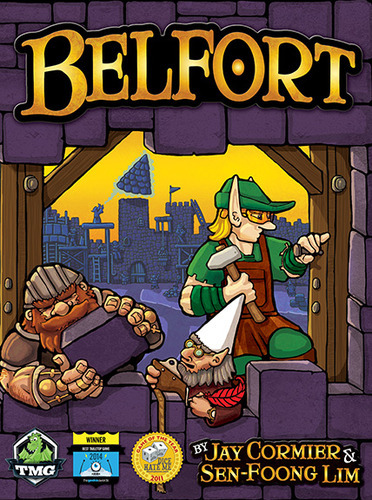 Nice new box top for Belfort with the Geekie Award logo upon it! Wicked awesome! 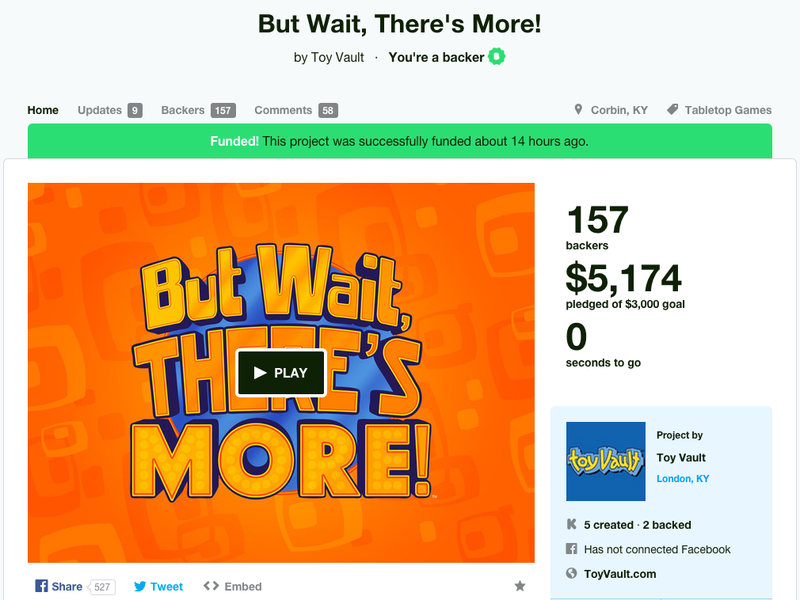 157 Backers and $5174 later, we successfully funded But Wait, There’s More! We are forever grateful to those who pledged, those who shared our campaign with friends, those who tweeted about it, and those who playtested the game to make it what it is today. We cannot *wait* until it hits game tables worldwide! Thanks again, for all of your support! 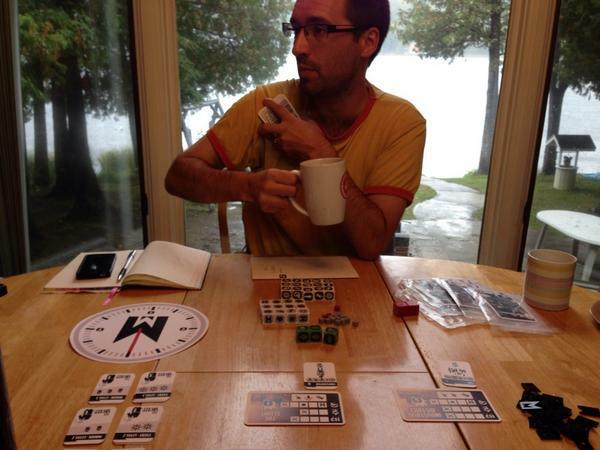 When not designing or playtesting games, I like to talk about games with other game designers. So I figured we should make a vidcast of what we do for fun anyway! I gathered together the forces of good (i.e. the Game Artisans of Canada) and Daryl Andrews answered the call as the co-host while Dylan Kirk and Jay Cormier (of course) would rotate in and out as available for colour commentary. We’re going to be doing this every Wednesday night from 11 p.m. EST for about an hour and a half, right after the Dallas Nerd Nighters show, in fact! They’ve been great in helping us troubleshoot some technical stuff and have welcomed us on their shows many times. So, stay tuned, if you’re into boardgame design, because we aim to bring you some of the best of the best when it comes to designers, live and direct! Wow, what a busy day that was! I went to Fan Expo on the busiest day of the convention with Jessey Wright (who worked at the Flux Capacity booth) and our friend Vince Londini. We drove up, parked the car and entered utter geek chaos! Once I made my way to the relative calm of Room 718 (the gaming area), I was greeted by many familiar faces and the rest of the Z-Man crew. We promptly punched out 4 copies of Akrotiri and got to work teaching people how to play! 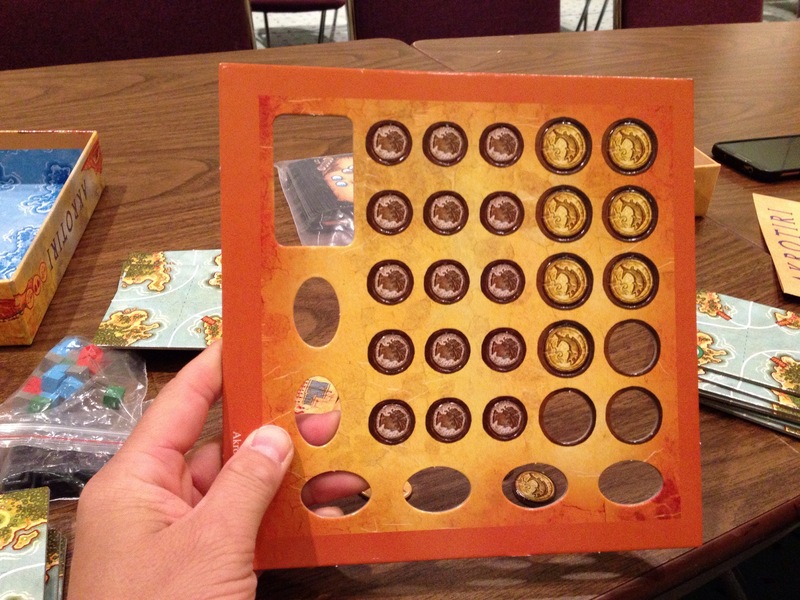 Here’s a picture of the punchboard and the nice thick coins. I think I taught about 12 people how to play, including my old friend Julian Sammy, while Daryl Andrews and Daniel Rocchi taught to even more people (including our good friend, Elly Boersema). It was wonderful to see people play the game and to hear the overwhelmingly positive feedback. Now that I’ve played it with people other than Jay, I can see the merit in the decision to pare it down from a 4-player to a 2-player game. That won’t stop me from getting a second set of components and colouring them differently to make a 4-player homebrew for myself, though! All in all, I’m very pleased with the game overall. Chris Quilliams did a great job on the artwork and the whole team at Z-man made sure that the rules are solid and the game plays really well. It’s a deep and meaty 2-player game that we hope you will enjoy playing just as much as we enjoyed designing it! After that, we added to the chaos of the room by helping to judge a round of Pandemic Survival, which is a super cool way of making a good game even better! Imagine 10-20 tables playing Pandemic in teams of 2…and everyone gets the same set of cards and deals with the same outbreaks in the same order. 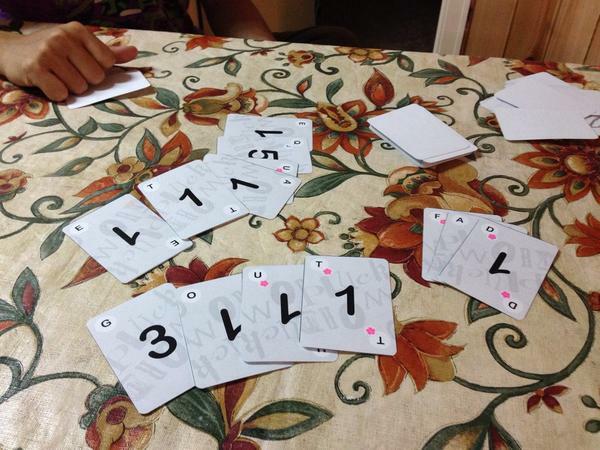 The only thing that separates each time is what they decide to do with those cards and their actions. It was pretty intense and down to the wire as several teams had 3 cures in the race for the 4th, but several were eliminated from play as outbreaks started to run rampant! Oh yeah, and the prize? The winning team gets to playoff against other winners for a chance to be airlifted to anywhere on the Pandemic map – you know, like…Montreal! The last thing we did was cap the night off (after eating at Burrito Boys) by playing one of Eric Lang’s prototypes that he co-designed with Antoine Bauza (he of 7 Wonders fame). Needless to say, it was pretty good. I’d tell you more, but you know the deal…I’d have to kill you. I’m looking forward to next year’s con but there’s many more between now and then! For my next guest appearances, I’ll be at CastleCon in Pickering on October 18th and London’s own Forest City ComiCon on October 19th. So if you’re local, come on out and play some games!